Divvy Bikes, part of Chicago’s new bike share program, have been popping up all over the city and last Wednesday I had the opportunity to try them out. I needed to run some errands and was short on time before a meeting, so instead of walking I decided to hop on a Divvy. 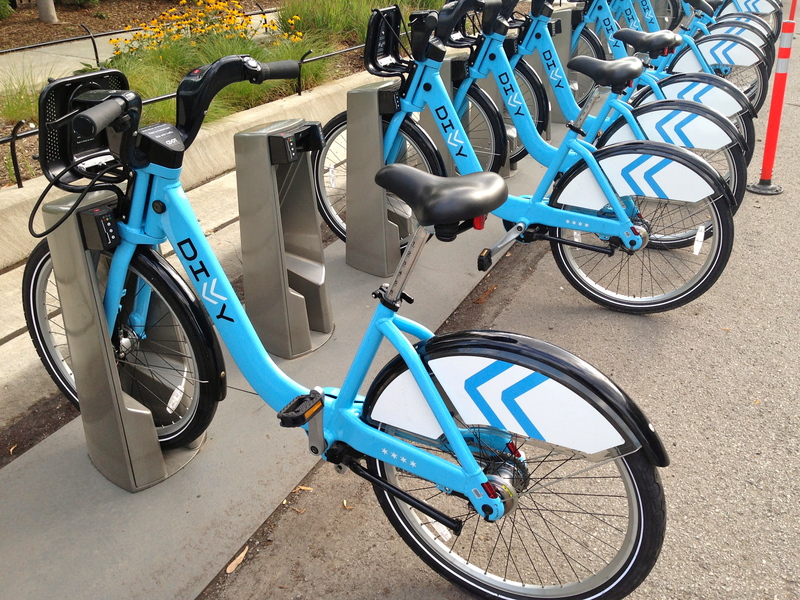 My Divvy experience began at the station at Fullerton and Racine near my office. 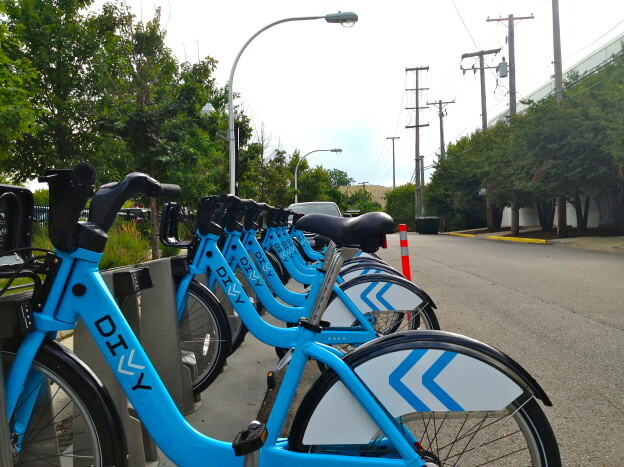 To get a Divvy bike you can either become a yearly member for $75, or pay for a 24 hour pass. Each bike pass is $7 for 24 hours, with a 30-minute limit on individual trips. 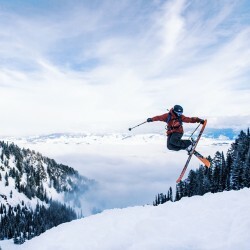 For 30-60 minutes an additional fee of $2 is charged. Riders are charged more the longer they keep the bike without docking it. Divvy is not meant to be a bicycle rental though. It’s geared toward short directional trips like errands and riding to lunch, making the initial 30 minutes just fine for most riders. Renting a bike for the first time takes a few minutes of agreeing to terms and entering some personal information into the kiosk. The only issue I had with renting the bike was the touchscreen. It seemed to accept my commands haphazardly and the calibration was off. It took me two minutes to enter my phone number because every time I would press one number, it would recognize a different number. After signing my life away and dipping my credit card I received a receipt with a code printed on it. Entering the code at the bike corral of my choosing got me a bright blue Divvy bike. The bikes themselves are actually quite nice. Solidly built in the model of Dutch commuter bikes, the bikes are manufactured by Cycles Devinci, a Canadian company that supplies multiple Canadian and American bikeshare programs, including Montreal, Toronto, and Boston. The bikes have a 3-speed hub gear system and a ridiculous little bell. There are front and rear lights that are peddle-powered which means they’re always on while riding. The placement of the rear lights, however, is in my opinion, much too low. The lights are mounted in the rear bracket, making them nearly invisible to anyone driving a car taller than a Lotus. The seat is comfortable and easily adjusted. 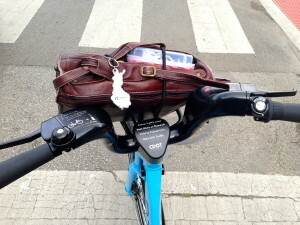 The real value of the Divvy bikes lies in the front-mounted cargo rack. Complete with an industrial-strength bungee cord, the rack held all of my errand-spoils and my briefcase easily. The only thing the bikes could really benefit from is a rear cargo rack to improve its carrying capacity. 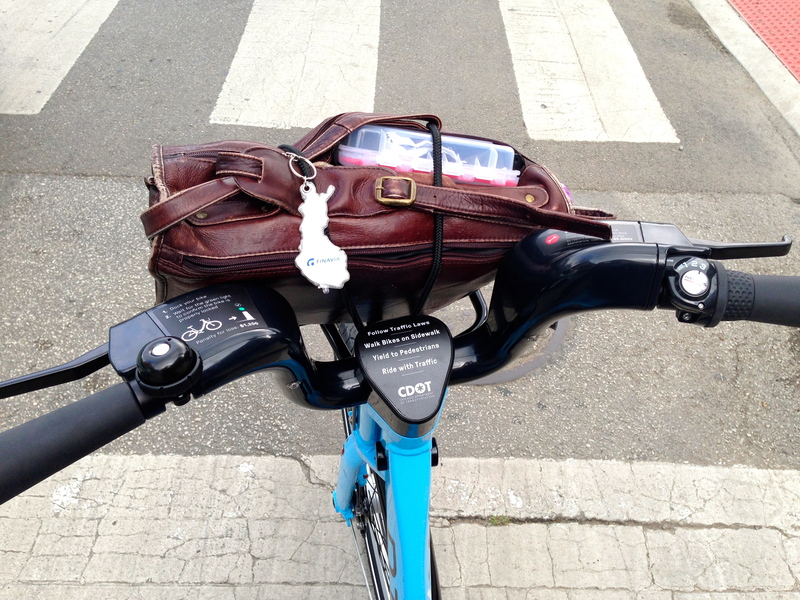 Divvy Bike cargo rack easily holding my briefcase. The ride was solid as the nearly 40-pound aluminum frame and rugged tires take the bumps and potholes of Chicago’s streets quite well. The three-speed bike is good for riding from stoplight to stoplight, but also for zipping along. The brakes were a little soft, but it wasn’t much of an issue because I never really got going fast enough to have the need to slam on the brakes. All of the machine components of the bike are covered, so you don’t have to worry about getting chain grease on your pants. Returning the bike when I was done was as easy as pushing it into one of the stands at the station and waiting for the light to turn green and let me know it was locked. Overall, Chicago’s bikeshare is off to a good start. 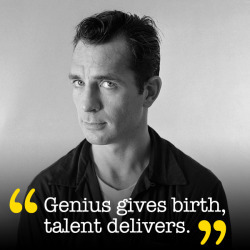 The rental system is easy and straightforward. And based purely on my very unscientific survey of looking around when I’m outside, I see that Divvy’s are being used regularly. 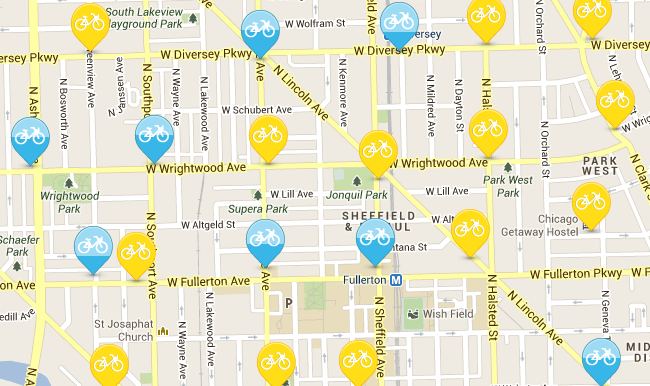 Divvy makes it easy to find a bike with their online station map. They also show where the next stations will be as the system expands outward from downtown. Blue markers show the current stations and yellow shows the planned stations. When the system is fully operational it will be easy to grab a bike and go just about anywhere. Divvy’s fill that niche when you want to go to lunch and it’s just a little too far to walk or you need to run some errands midday, and they fill it well.